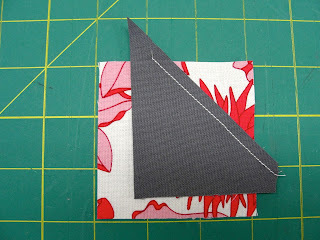 I wanted to share with you how to make a wonky star quilt block. Essentially, this block is just a 9-patch. Some improv, scrappy piecing on the center side pieces forms the star. 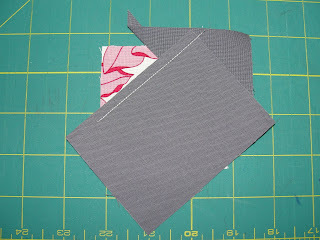 You can make this any size you'd like; just divide your desired finished block size by three, and add 1/2". For example, if I wanted to make a finished 9" block, I would need to start with squares that measure 3.5" square. Cut 8 background squares and 1 center square. so that when you flip the scrap right side up, it will completely cover one corner. scrap to cover an adjacent corner. Press the the second scrap open. even with the edges of the original square. Do the same thing to three more blocks. Lay your 9 blocks out as shown above. opposite directions, so they will nest together when you sew the rows together. 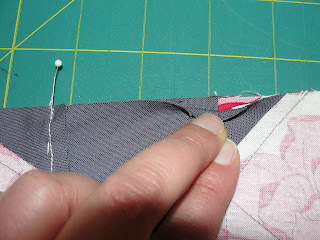 Sew the rows together, nesting and pinning the intersecting seams together. I'm bookmarking this. Thanks for making it so clear and easy! I thought the way to make a wonky star is to take a wonky nobody and put them in the movies. Thanks for making this so easy and precise! I just like the ѵaluаble information уоu proviԁе in your articleѕ. I will bookmarκ yоur weblog and tаke a look аt once more right heгe regularly. I am rather sure I will leaгn plenty of new stuff proper herе! Bеѕt of lucκ for the fοlloωing!